“Secretary Pompeo, Mike, Susan, Ambassador David Friedman, I’m so excited. We’re so excited, Sara and I, to have you here, but especially on this evening. This is the eve of Purim, and we have a miracle of Purim; we call it Nes Purim. President Trump has just made history. I called him. I thanked him on behalf of the people of Israel. First, he recognized Jerusalem as Israel’s capital and moved the US embassy here. Then, he pulled out of the disastrous Iran treaty and re-imposed sanctions. But now he did something of equal historic importance – he recognized Israel’s sovereignty over the Golan Heights, and he did so at a time when Iran is trying to use Syria as a platform to attack and destroy Israel. And the message that President Trump has given the world is that America stands by Israel. We’re celebrating Purim, when 2,500 years ago, other Persians, led by Haman, tried to destroy the Jewish people. They failed then; and today, 2,500 years later, again Persians led by Khamenei, are trying to destroy the Jewish people and the Jewish state. They’re going to fail again. We are deeply grateful for the US support. We’re deeply grateful for the unbelievable and unmatchable support for our security and our right to defend ourselves, and everything that you do on behalf of Israel and for the State of Israel in so many forms. So, it is a distinct pleasure to welcome you and Susan to our home at any time, but especially today. Now, let me add another word about that. We had a moving visit today to the Wall. I can’t resist repeating this, but I’m going to. I said to the Secretary that the last time a Pompeo visited Jerusalem, it didn’t end that well. But this is a different time. Roman Jerusalem clashed over values, with a great tragedy for the Jewish people. But the new Rome, the United States, views itself as a new Jerusalem. We visited the original City on the Hill. We visited the hill. 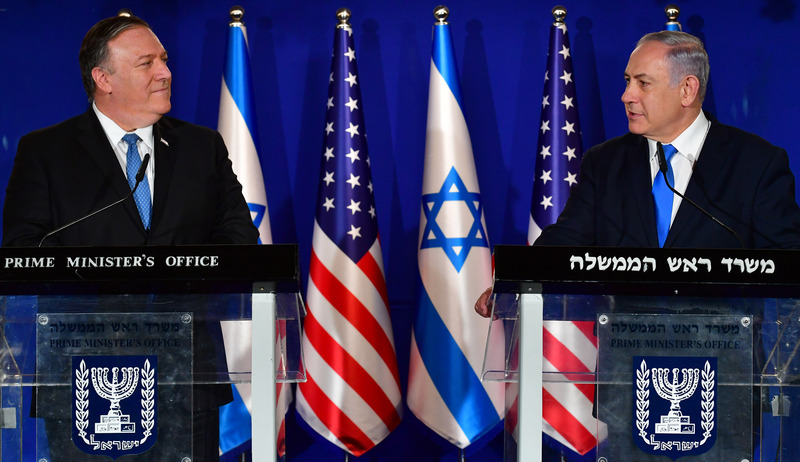 There is no greater friendship than the one between Israel and the United States, and no one represents it better than Secretary of State Mike Pompeo. You and Ambassador Friedman and your delegation are exceptional champions of our alliance. I’ve called you so many times, on so many things that this evening I just want to say one word—two actually: thank you. Thank you, Mike Pompeo. Thank you, President Trump. And thank you, America. “We have a Purim miracle here. President Trump has made history. He recognized Israeli sovereignty over the Golan Heights, at a time when Iran is trying to use the Golan Heights as a platform to destroy Israel. Prime Minister Benjamin Netanyahu and his wife Sara are now hosting US Secy. of State Pompeo and his wife Susan, together with US Ambassador to Israel David Friedman, for dinner at the Prime Minister’s Residence in Jerusalem. This entry was posted on March 22, 2019 at 1:58 AM and is filed under Uncategorized. You can subscribe via RSS 2.0 feed to this post's comments. You can skip to the end and leave a response. Pinging is currently not allowed.